I first started racing triathlons in the mid 1990s in Virginia. At the time, there weren’t many local races to choose from, so it was feasible to participate in every local race. There was only a single Half IRONMAN (Eagleman) within driving distance and the closest full IRONMAN was in Florida (Great Floridian Triathlon). Fast forward to today, where there are many more options for races of all distances – nearly 4,400 races sanctioned by USA Triathlon in 2014. Depending on where you live, you may be able to find a race within driving distance every single weekend through the racing season. With so many racing options, choosing which races to do can be a tough decision. 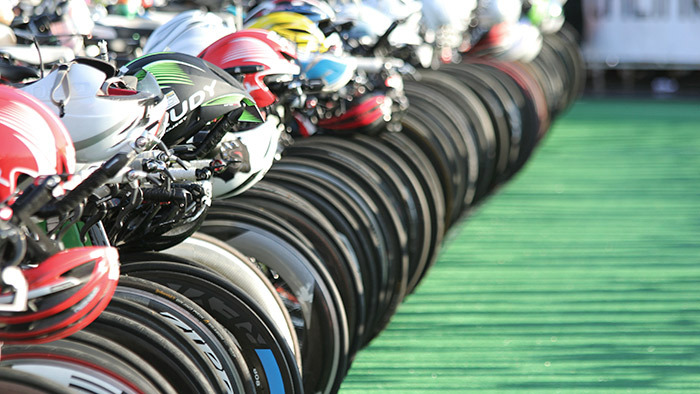 Here are six steps for choosing the best triathlon races for your next season. What would you consider success for next season? Do you want to complete your first sprint triathlon? Place in your age group in a favorite race? Or, perhaps qualify for the IRONMAN World Championship? “Begin with the end in mind,” as Stephen Covey said. Goals are an excellent point to start from, then work backwards. Think of your training and races as the stepping stones that lead to your long-term goals. Commitment level is the other side of the coin. What can you reasonably commit to in terms of training? If you have limited time to train each week due to other commitments like family and career, or lack the motivation to train long distances, tackling an IRONMAN-distance race may not be realistic. However, sprint and Olympic distance triathlons may be very doable. Not only is it important to look at the time of year for the race, but also when you’re training will be. For example, a race in early April may make sense if you live in the southern half of the U.S., but training for an April event may be challenging if there’s snow and ice on the ground in February and March where you live. In addition, training for late season races like IRONMAN Florida can be tough as the days are shorter and training in daylight during the week may not be possible depending on your work schedule. Where does the race take place? Is it easy to travel there? What else is in the area? I loved racing in the Challenge Roth Triathlon in Germany. For me, it was an opportunity to visit Europe and race on a fast, scenic course. I spent extra days before and after touring Bavaria and enjoying the local beers and food. However, travel was expensive and time consuming, as I lost a day on both ends of the trip. At the same time, being able to walk to the starting line of the Reston Triathlon in Virginia was wonderful, too. I could sleep in my own bed and race on a familiar course with friends. A race venue can be a selling point when bringing a significant other or family to race. How many spouses and significant others would enjoy wine tasting in Santa Rosa after their athlete finishes the IRONMAN? Does the course play to your strengths or work against you? Choose the races with the courses that favor your strengths and minimize your weaknesses. For example, an athlete who lives at altitude in Boulder, CO, and trains on the hills, has a clear advantage racing in Boulder over another athlete who lives at sea level and trains only on flat terrain in cooler temperatures. How does each race support the next, and lead you towards achieving your goals? Using other races leading up to your “A” race provides an opportunity for you to practice the mechanics of racing triathlon, builds confidence, and helps you evaluate your fitness. I suggest progressing in distance if possible. For example, prior to racing a Half IRONMAN, I’d recommend racing a sprint, followed by an Olympic distance triathlon. Next best thing would be to race one or the other prior to stepping up to a Half IRONMAN. Other events like open water swim races, cycling, and running races can also be substituted if a triathlon is not available. This chart shows the recommended time (in weeks) after doing a race before doing another race. For example, if I was doing IRONMAN Florida in November and wanted to do a Half IRONMAN prior to Florida, I’d choose a half that was 5-8 weeks before like IRONMAN 70.3 Atlantic City in September (also a saltwater swim and flat course).Keep in mind that these are suggested guidelines. You and your coach may decide to follow different guidelines. What do the athletes who have completed the race think about the experience? Would they do the race again? Social media and blog posts are excellent resources for learning about athlete experiences. I hope that using these 6 steps will help you choose the best races to have your best season yet.